As Frazer just said: "A great depiction of an iconic car, I think all children of the 80's had a [Lamborghini] Countach poster on our walls growing up!" So — be honest. 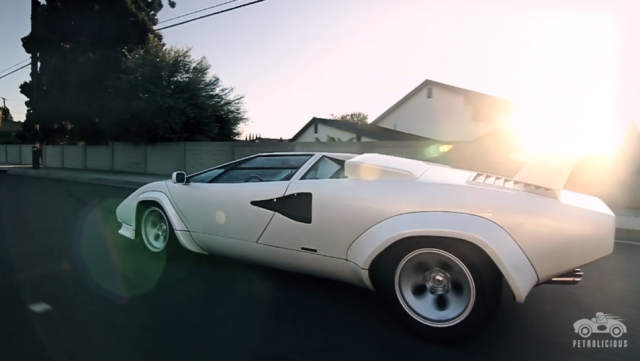 Wasn't it the Lamborghini Countach we were all dreaming of? I still do. To be honest. Gorgeous Petrolicious video via Jalopnik. Via Josh Clason (Depth of Speed) & Petrolicious.com. TBC Hot Rods and Bikes by Josh Clason (Depth of Speed). Btw, Mr. Kaps, what about a weekly meet in your garage? John Jackson (Not Stock Photography) by Josh Clason. Btw, Josh, hasn't that 1964 high mileage Corvair van been blue back in 2010?